“By the time you read this letter, I may be dead…. If this reaches you, you will know how I became yours when you didn’t know who I was or even that I existed.” Thus begins the letter that gives Letter from an Unknown Woman its title. Lisa Berndle’s (Joan Fontaine) words arrive to us from the threshold of death, while her voice irrupts into our world from some elsewhere. The letter’s recipient is a certain Stefan Brand (Louis Jourdan), the object of Lisa’s dying devotion, a man who has been blind to her love, and whom this letter wishes both to cure from this condition as well as to condemn him for it. This letter will release Stefan to his death, a fate that he ultimately embraces. By the end of the film, Stefan chooses to fight a duel he initially intended to flee, and one which he is certain to lose (1). At the same time, the letter is also delivered to us, the film’s audience, since Stefan’s reading of the letter initiates a single flashback (2), whereby we receive the letter’s content as narrative images that seems to emanate from Lisa’s point of view (bridged, from time to time, by her voiceover, which haunts the screen). At stake here is only one thing: her existence has been unacknowledged, a fact that quite literally, kills her. This is the reason she comes back to haunt the screen; her plea for acknowledgement posthumously directed both to Stefan and to us. Lisa melodramatically fuses the power of her fantasy with her sense of existence: “as hard as it may be for you to realize, from that moment on I was in love with you. Quite consciously, I began to prepare myself for you.” There are few characters in film history who so purely embody the momentum of melodrama. This film, thus, seems to derive its genre less from convention than from Lisa’s very being, a being staked, not unlike that of the tragic heroines of opera, on curtains that rise and fall, until they no longer rise again. Film, of course, unlike opera, is a medium of resurrection, where images can come back to haunt us from a distant past; the melodrama of this film exploits this fully. In many operas’ episodic raising and falling of curtains, the potential for the tragic heroine’s happiness always lurks behind a latent revelation, a pulsating recognition, or simply the elusive, right timing. But in opera, these concerns inhabit a social landscape (as they do in other melodramas). In Max Ophuls’ film, the landscape of turn-of-the-century Vienna is instead transformed into a stage of Lisa’s desire: doorways, stairs, streets and trains are the cinematic vehicles that enact oneiric entrances and departures, moments pregnant with the psychic promise of happiness – in the imagery of the film, happiness is a fairground – that will not be realised (3), and thus Lisa meets the same fate as her operatic forebears. Lisa’s fantasy-scape is laid bare for us, turned into the geographic labyrinth of a city where the only passerby that matters is Stefan. Of course, it is no coincidence that the city is Vienna, the place where Freud reared his theories of psychoanalysis, irretrievably changing our contemporary perspective on consciousness. But the film does effect an interesting reversal of Freud’s talking cure, since Lisa’s words and “impossible voice” are meant to cure another (4). Apropos its theatrical origins, the second part of the film takes us in medias res to the opera house, where a production of Mozart’s The Magic Flute is taking place (5). Lisa’s voiceover introduces this sequence: “The course of our lives can be changed by such little things. So many passing by, each intent on his own problems. So many faces that one might easily have been lost. I know now that nothing happens by chance. Every moment is measured; every step is counted.” Melodrama evokes a precise world, one where ordinary gestures are taken with deadly seriousness and meaning is inscribed in its silent outbursts. It is, after all, a world since inhabited by the 19th century figure of the hysteric: a body presented as a readable surface of symptoms that must be deciphered (6). Here, the film itself enacts this hysteria, presenting us with a predetermined universe, tensed to convey meaning. Thus, in this sequence, Ophuls makes his directorial presence felt as he delivers to us, and Lisa, the lost object of her desire, the sole actor in her fantasy world: Stefan presented at the bottom of the grand staircase (7). Stefan had, after all, only scenes before (nine years earlier), disappeared from Lisa’s life as a train took him away from her. Ophuls’ authorship is melodramatically and self-consciously asserted in the excessive, obsessive and constantly restated revelation that nothing happens by chance. This is reinforced by the film’s style. For example, the crane shot that instigates Stefan’s re-entry into the film underlines the felt sense of a directorial presence (of Ophuls? of the dead Lisa?). The camera is initially positioned within the lingering crowd in the opera foyer during the entr’acte; it is the first time that the entrance of the camera precedes Lisa’s presence in the film (8). As the crowd begins to gather and move past and through the camera’s distracted line of vision, Lisa and her now husband, Johann (Marcel Journet), appear. Seeming to have remembered its subject, the camera moves closer to them and, as Lisa takes her first set of counted steps up the opera staircase, an off-screen voice calls out “Curtain, curtain going up, second act!”, self-consciously bringing attention to the film’s own second act. The walk up the stairs is accomplished as part of what is still a single long take, and as Lisa reaches the top the camera frames a group of anonymous onlookers who, like the offscreen voice before and the camera’s gestural movements within this scene, underscore the next event, “Look, isn’t that Stefan Brand?” This cues Lisa to join them at the banister, the closely gathered audience reminding us of our own fellow spectators in the cinema. Only then does the camera finally cut to what we take to be Lisa’s point of view shot: a high-angle shot of Stefan, a lost object now regained. This is the magic and the curse that film can perform. Lisa’s fantasy world is perfectly sealed. She stakes out and creates a world rather than inhabiting a pre-existing one. Fantasy, in other words, presents us with a solipsistic universe, with room for only one. This has proven to be an enduring topic for film, and perhaps one of the reasons the themes of Letter have proven so timeless. Take, for example, a film like Alfred Hitchcock’s Vertigo (1958), which returns to and inverts these themes, citing, I believe, Letter as a key point of reference (9). Despite its thematic inversions, Vertigo, like Letter, is also predicated on a second act that delivers to our main protagonist his lost love. Judy (Kim Novak) also writes a letter that is meant to reveal truth to a man, Scottie (James Stewart). But Judy, unlike Lisa, tears that letter up, tragically lending herself to Scottie’s searing fantasy and its calamitous consequences. Yet in both films nuns ensure the enactment of punishment for blindness: a nun ensures delivery of Lisa’s unfinished letter, and a nun fatally interrupts Scottie and Judy in the bell-tower. Note that Judy’s plea to Scottie is not unlike Lisa’s to Stefan, they both ask a man to recognise their passion, their love. “Can’t you see?”, Judy belatedly asks Scottie as he buckles the pendant that will initiate a barrage of past images from the film – but acknowledgement, as in Letter, never comes. The presentation of Vertigo’s set of revelatory, “assaulting images” is similar to those of Lisa at the end of Letter, as Stefan performs the melodramatic gesture of covering his eyes – of seeing without seeing at all (10). The tragedies of both films are at once the same but also different, something that can only be pursued elsewhere. Have you ever shuffled faces, like cards, hoping to find the one that lies somewhere just over the edge of your memory, the one you’ve been waiting for? Well, tonight when I first saw you and later when I watched you in the darkness, it was as though I had found that one face among all others. Who are you? But as the minutes creep painfully by inside his apartment, Stefan admits that he has lost hope in that myth, that he now knows better. As he continues to entertain Lisa with romantic platitudes, making evident that romance takes on different configurations for each of them, no more or less ill-conceived but certainly with different investments and stakes, he finally pronounces the words that will deliver her to her death: “So you travel a great deal?” The question stuns Lisa into silence; he does not in fact remember her at all, has no idea who she is. 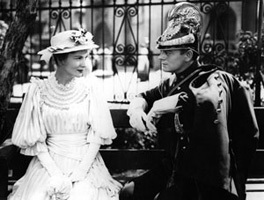 Earlier in the film, at the fairground, they ride a stationary train together where Stefan charmingly expresses to her; “you know far too much about me already, and I know almost nothing about you, except that you travel a great deal”. How could he have forgotten one of the most memorable scenes of this film, one that, though decades of film history have passed, is still cherished and well remembered? (This is nothing Ophuls could have predicted, proof of the fact that film can also perform magic without a magician, that authorship is mortal). The narrative gives us a worldly explanation for Lisa’s death, telling us that, like their son, she contracted “the fever”, but in the tradition of melodrama the film follows, the sources of illness – and death – must be found and placed elsewhere. Shortly thereafter, a static high-angle shot watches Lisa move diagonally from the bottom of screen left to the top of screen right, already almost a shadow; here she literally exits the film’s frame, never to be recovered again – except as a flash of past images, or as a ghostly superimposition, or in our viewing and re-viewing of this film again through time. In all these cases, all we have access to are scenes from the film itself, scenes we merely revisit – not unlike Lisa’s beloved train travel. Yet the question arises: What right does Lisa have to ask this man for recognition? Must we rebuke him? Stefan has never been anything other than a man predicated on existing in an evanescent present. He is a man who also has a stake in his fantasy of an ideal woman who never arrives. Thus, a world conceived with the deliberateness of a stairway, where every step is fatefully arrived at, meets the randomness of one envisioned as an endlessly shuffled deck of cards. Fantasy is the inescapable violence we enact upon each other, making the Other invisible. The power of melodrama, and certainly of this melodrama, resides precisely in luring us to these realisations through the banal, the sugar-coated, and perhaps the even laughable desire of a certain unknown woman. On the subject of Stefan’s conversion by the end of the film and its representation of a man’s journey into Symbolic Order, and thus into History, see Tania Modleski, “Time and Desire in the Woman’s Film”, Letter From an Unknown Woman, ed. Virginia Wright-Wexman and Karen Hollinger, Rutgers University Press, New Brunswick, 1986, pp. 249-262. Her reading begins from the observation that what is at stake in this film is a man’s word (249) and a woman’s silence (250). I do not take issue with Modleski’s reading which focuses on the representation of gender through the tropes of temporality, stasis and action. I call this a single flashback because the story told in flashback is presented entirely in chronological order with only three interruptions that bring us back to an image of Stefan reading. The “single” flashback in fact uses these moments to perform temporal ellipses, moving Lisa’s narrative forward in time. Wright-Wexman reads these tropes (the threshold, the stairway, the street) as chronotopes in her introductory essay to the edited collection cited above (“The Transfiguration of History”, pp. 3-14). Letter evokes the turn of the 19th century to partly avow the bond that psychoanalysis and film share in delivering and shackling us into modern consciousness. It is impossible for me to pursue the implications of this point in this short essay, but one may refer to Stanley Cavell’s chapter on the film that partly focuses on this problem. See Contesting Tears: The Hollywood Melodrama of the Unknown Woman, University of Chicago Press, Chicago, 1996, pp. 81-113. As far as I can tell, The Magic Flute does not provide this film with a palpably relevant subtext (beyond perhaps the trope of magic and its probable improbability). The figure of the hysteric, of course, is also central to the birth of psychoanalysis. Freud, when he was a neurologist, began to fully pursue the path of psychology after spending time in the Salpêtrière Hospital (1885-6) in Paris where he was deeply influenced by Charcot’s studies on hysteria, which demonstrated that intangible ideas or thoughts could be causal agents in neurosis. I focus here on melodrama as providing an embodiment of the hysteric. For a discussion of this film’s characters as hysterics, see Modleski. The shot from the top of a stairway is one of the dominant motifs in the film. For an excellent analysis of this visual motif refer to Wright-Wexman’s essay. As with the case of the “single” flashback, this is perhaps not exactly right. There is one other scene where the camera seems to come in search of Lisa, in which, after having said goodbye to Stefan at the train station, Lisa disappears from the frame close to the top of screen right and walks away from the camera. This shot is followed by a dissolve, cueing a temporal ellipsis, that reveals from the top screen right the image of a nun appearing from the darkness and walking toward the camera (almost fusing with Lisa’s position in the previous shot – Cavell calls this Lisa’s cinematic transfiguration into a nun ). The nun walks among curtained enclosures, until she comes upon the curtain that reveals Lisa, who has just given birth to her and Stefan’s illegitimate son. This figure is something to keep in mind when noting that Lisa’s letter arrives to Stefan from a “Sister in Charge”. Furthermore, if we consider this film as a key intertext with Vertigo, it gives further depth to the death-precipitating presence of the nun in the latter film. Bill Rothman’s essay on Vertigo also notes points of similarity between these two films. See the chapter entitled, “Vertigo: The Unknown Woman in Hitchcock” in his The “I” of the Camera, Cambridge University Press, Cambridge, MA, 1988, pp. 152-173. Wright-Wexman makes the point that Stefan and Lisa are “irrevocably trapped in the insubstantiality of their imaginations” (10). I agree with this statement except for the fact that whatever we make of Lisa’s imagination, insubstantial is not an adjective that fully describes it.